The complete game is now playable in 3D! That means that you can play in zone 2, equip any items or cast any spell while you are enjoying the new graphic mode! - The complete game is now playable in 3D! Zone 1 of Forgotten Elements 3D is finally online! I would be happy if you would post suggestions, comments and bugs here. Just add a child to the desired object with object3d.addChild(child), move it higher with child.translate(0,-20,0). Don't forget to set Billboarding ability with child.setBillboarding(true). Support / Re: uv-coordinates HELP? Keep in mind that the resolution of the texture should be a power of 2. Really impressive! Great work! How many people were involved in this project? Only me (and one person who wrote the story). Thanks for your words! 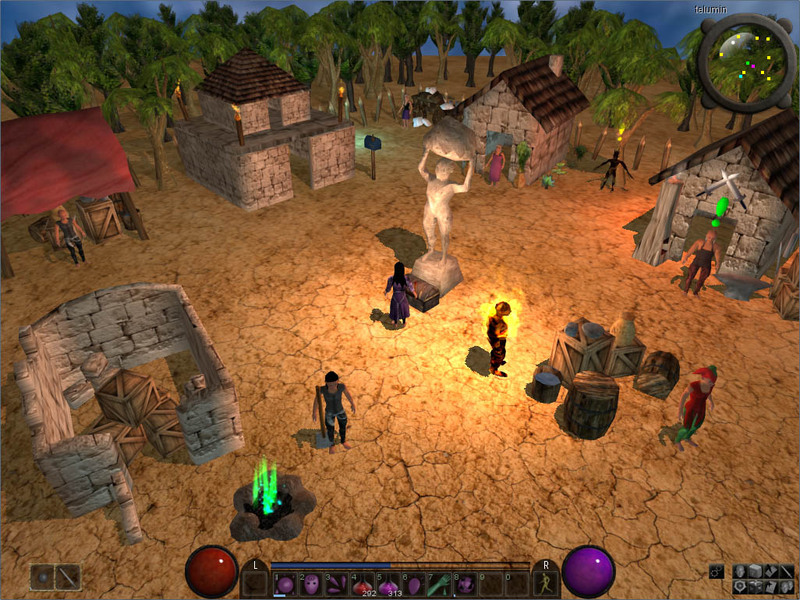 Forgotten Elements 3D Test Version was just released! Tell me if the sound is running on your computer and the program exits without any problems. I decided to use SoundSystemJPCT in the testing phase of my project. 1. As I mentioned before, on my Windows 7 Notebook the whole program crashes, when using the SoundSystem. It crashes when I call SoundSystem.cleanUp(), when trying to close the program. While running the program, there is no problem. There is no error log, only a "JAVA(TM) Platform SE binary" window, after returning to windows. On my other pc it runs without problems. 2. I want to play an ogg file as backgroundmusic. How can I load the ogg file (absolute path) from the disk and play it? 3. Is there a way to set a mastervolume for all sounds (played with quickplay()) and a mastervolume for the background music in a separate way? On my other computer SoundSystemJPCT seems to run fine (which is having other problems though). Yes, your name is written and it should clean up successfully. By the way... is it possible to deactivate any console output? You can deactivate the console output by creating a minimal extension of the Logger class with all the printing methods overridden (take a look at the sourcecode to see which methods). If cleanup is completed successfully, I'm not sure what would be causing that crash. You aren't trying to play any other sounds (like in the menus or on exit)? I play sounds from the menu, but then I call quickPlay() without an Object3D. I play an mp3 as stream as well, but I don't think that this causes the problem. Is it possible to play mp3s as background music via your SoundSystem as well? With the integrated OpenAl32.dll it works! Unfortunately sometimes the Nullpointer Exception I mentioned before still occurs. But I catch it and its ok.